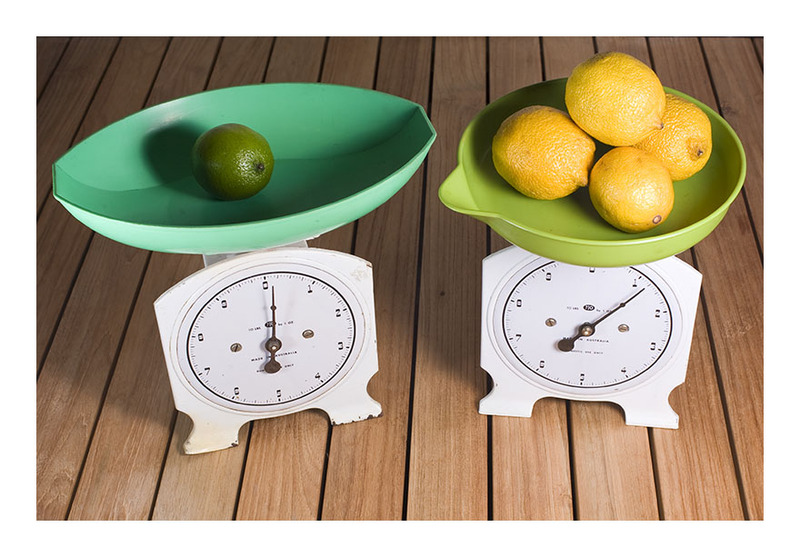 This pair of metal scales come with their original plastic measuring bowls- an elongated oval in dark green, and an apple-green rounded bowl with pouring lip. The white enamel is a little scuffed in places, evidencing their role in the kitchens of Australia for the last fifty-or so- years. Both scales are still accurate [I have tested them against a digital 2013 scale] and weigh things up to ten pounds, by 1 oz increments. The scales have an adjusting knob on the back, to allow for the weight of the bowl itself. The elongated oval bowl on the left is now very collectible- as they are becoming increasingly rare. thanks afacette….the poring bowls come in all sorts of strong colours. if my kitchen was big enough, i’d put 20 scales- all with different coloured bowls- in a line. that’d hold some fruit!